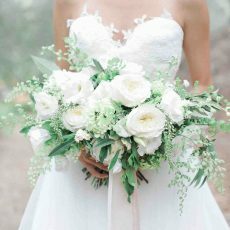 A Calla Lily bridal bouquet is the epitome of elegance. 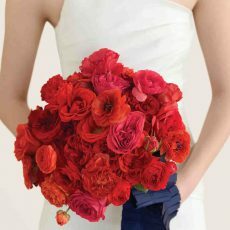 They are a classic wedding flower for a bride who wants to portray simple elegance. 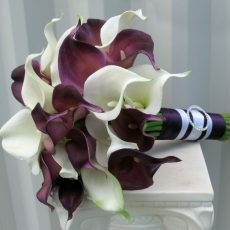 Traditionally, white calla lilies have been the classic choice; however, the current availability of callas in a wide variety of colors opens up a number of bouquet options. 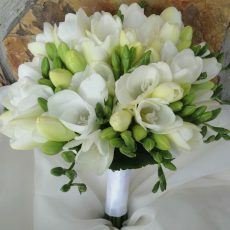 This dainty freesia bridal bouquet is small, but exquisite. Filled with white freesia and sweetheart roses, it is accented with blue and white muscari. The greenery is trailing spengeri. Finish with a sheer ribbon for a bridal bouquet that is heaven! Freesia has a divine scent and comes in many colors, including white, pink, lavender, yellow and rust. 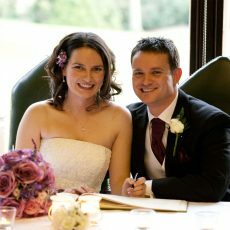 Marquee weddings are starting to beome very popular here in Ireland. 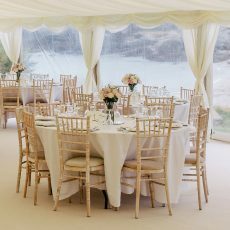 Choosing the right flowers really can transform a marquee and create a fantastic athmosphere to match the occasion. Rose come in a large range of colours and species, and available almost all-year round make this flower the most versatile. Practically any type of rose can be used in bridal bouquets, but most of the common ones are Black Baccara, Avant-garde, Milano, Aqua, Sweet Akito, Bianca and Avalanche roses.